This webinar explains the WHO process for validating elimination of LF as a public health problem and provides examples of developing the dossier. Dr. Jonathan King introduces the WHO process and dossier template. Next, Dr. Karim shares Bangladesh’s experience on preparing a ‘pre-dossier’, particularly compiling and validating the necessary data. Dr. Virak then shares practical experience from Cambodia on developing the dossier and moving it through the validation process. Speakers then answer questions from webinar participants. Is the WHO LF Validation Handbook available in any other languages? It is currently available on the WHO website in English (http://apps.who.int/iris/bitstream/10665/254377/1/9789241511957-eng.pdf ). It will be available in French in March 2018. Are donors/others besides program managers able to obtain the documents Jonathan mentioned in the webinar? The documents are available to anyone. Please email Dr King at kingj@who.int with specific requests. How many countries have been validated LF free through this process globally so far? Ten countries have been validated thus far. When should a country prepare the pre-validation dossier? The compilation of data and writing the narrative for the dossier can begin any time. The sooner, the better! The background section can be written in draft and updated as needed before submission. For example, the endemicity section can be written for most countries now, as most have finished mapping. Does the whole dossier get submitted together, or can it be done piecemeal (e.g., mapping sections first, followed by TAS results, burden assessment)? While the dossier can be written piecemeal, as the country moves through the program phases, the dossier should be submitted together as documentation claiming the achievement nationally. In countries where some areas may be "off limits" due to security issues, can a pre-dossier be prepared and reviewed by WHO if the criteria are met for the rest of the country? Validation occurs at the national level, once all endemic IUs have met criteria. WHO can review a dossier informally and provide feedback. However, formal acknowledgement can only happen once all endemic areas in the country have met criteria. Does it have to be developed by an international consultant or can countries do it themselves? Does WHO have a list of suggested consultants? It does not have to be developed by an international consultant. However, if a country requests this type of support, WHO can make suggestions in consultation with the WHO regional office. In Bangladesh and Cambodia was a writing committee established for the preparation of the dossier? In Bangladesh, a writing committee was not established. Instead a consultant worked with the program staff to draft the dossier narrative. In Cambodia, there was no official writing committee, but the national program staff worked with WHO, FHI/RTI and a consultant to prepare and develop the dossier. Have countries used the WHO Integrated NTD Database in the dossier development process? Or what other data management software packages have been used by countries? 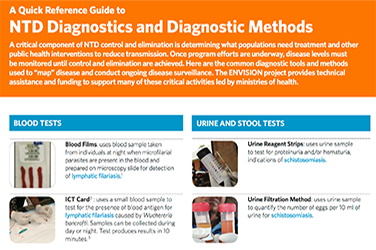 The WHO Integrated NTD Database is currently being updated to include a standardized report that will provide the information needed for the dossier data file. Once this is complete, countries will be able to use this for the dossier submission. Currently, countries have copied and pasted from data in the integrated NTD database reports into the dossier Excel file or have used other data sources/databases to fill in the dossier data file. How long does the review process take? According to the WHO Validation Handbook, this process must be completed within a year. In general, the review should take no more than 3 months from the submission of the dossier by the country, provided all relevant information is included. Countries can submit a draft dossier to WHO for informal review before the formal submission. Are there any guidelines on post-elimination surveillance available? What should be included in the dossier about ongoing surveillance for new cases? There are no guidelines available yet for this phase in the programme. WHO is learning from the activities being implemented in the first validated countries to develop more specific and perhaps standardized guidance on post-validation surveillance. A commitment to post-validation is required and it is preferred that the programme already identifies a platform and methods for post-validation surveillance before submitting the dossier. What happens if there is a new case after validation is completed? This may occur during post-validation surveillance activities. If this is a new case of lymphedema or hydrocele, the country should ensure that the patient has access to the basic package of care. If an individual is identified as FTS or Mf positive, then the patient should be treated and the programme should decide whether any further investigation is required. For example, if a cluster of cases is found, further response might be necessary. In Bangladesh, if new cases are found during post-MDA surveillance activities, the programme provides them chemotherapy along with their full family and surrounding 20 households. For new hydrocele patients, they are provided surgical services via hydrocele surgery camps. Can you speak more about xeno-monitoring during post-MDA surveillance? Currently there is no recommendation for the use of xeno-monitoring in Global Programme to Eliminate LF (GPELF). The main challenge is the inability to develop a standardized way of collecting, sampling and processing mosquitoes across the various parasite-vector combinations. How should potential resurgences from neighboring countries be managed? There is no specific guidance, but a programme could target active surveillance activities in cross-border areas. In Bangladesh, how was the pre-dossier survey for uncertain endemicity done, using RDT or night blood slides? School-based TAS were done using ICTs in 15 uncertain districts in Bangladesh, and all passed. In Bangladesh, what was the result of the survey in non-endemic districts neighboring highly endemic districts? TAS were implemented in 7 non-endemic districts neighboring highly endemic districts and all 7 passed. Is the minimum number of rounds of treatment for MDA the same for all levels of prevalence of LF? WHO recommends at least 5 rounds with effective coverage regardless of the baseline prevalence. Why would some districts have more rounds of MDA than the others, such as in the case of some districts in Bangladesh? Baseline endemicity, coverage, mosquito density, type of vector, etc. are all factors that we know influence impact of MDA and can cause more than five rounds needed in certain areas. What was the reason for 13 MDA rounds in Bangladesh? In Bangladesh, the highest number of MDA rounds was 12 in three districts. Mf surveys were done after six rounds of MDA and every year thereafter to determine if the district could move to TAS (e.g. had results of <1% Mf). However, results showed more than 1% and it took 12 rounds to reduce the MF rate <1%. These were districts with high baseline prevalence. Is there a role for integrated vector control and the use of bednets? WHO recommends vector control to supplement MDA. Bednets can help prevent transmission in certain settings depending on characteristics of the specific LF vector. Is there an available methodology or protocol from WHO about MMDP situation analysis? WHO has a draft situation analysis questionnaire that countries can use to compile known information about current estimates of lymphedema and hydrocele patients, ongoing MMDP activities by government and NGOs, and potential platforms and partnerships. It also includes an annex with a list of pros and cons of methodologies to collect information on numbers of patients. Anyone wanting a copy should contact Dr King at kingj@who.int. The situation analysis will be added as an annex to the second edition of the WHO LF MMDP aide memoire, which is forthcoming. In Bangladesh and Cambodia, how were the patient estimates for hydrocele and lymphedema done? In Bangladesh, in the 19 endemic districts and the 15 ‘uncertain’ districts, a workshop was done at district level with health workers to train them on identifying suspected cases. These trained health workers then went house-to-house for a week to search for cases. In seven highly endemic districts, Japan International Cooperation Agency supported surveys in 2005 to go house-to-house to develop a line listing of patients. In other districts, with support from Liverpool School of Tropical Medicine since 2014, a SMS methodology was used to search for patients. Patient estimates are now complete for all 34 districts. In Cambodia, the hydrocele and lymphedema information were collected by 1) using a Questionnaire for Health Centers to report suspected hydrocele and lymphedema cases; and 2) the national team going and confirming suspected hydrocele and lymphedema cases. Who do we approach for support for burden assessments? What’s an acceptable standard of information for burden assessments/patient estimates? Multiple options are acceptable for assessing burden/estimating the number of patients, including house-to-house surveys, point prevalence from coverage surveys, pre-MDA registration, etc. There are advantages and disadvantages to each option, but the important outcome is an estimate of the number of patients by IU that can be used to prioritize services, plan for activities, and estimate budgets. How can morbidity management and disability prevention for LF clinical cases be integrated into an integrated NTD control program? In Bangladesh, collaboration between NTDs happens regularly; however, there are no specific LF MMDP activities integrated with other NTDs. Health workers were trained at district level and below to provide lymphedema and acute attack management services. Liverpool School of Tropical Medicine has supported hydrocele surgery campaigns. In countries which have LF and podoconiosis in some areas, what is the fate of podoconiosis-only areas? A health system providing the minimum package of care for LF patients should have capacity to provide care for podoconiosis patients as well. How should a country work on the LF dossier if treatment for onchocerciasis is continuing? The country LF programme should work on the LF dossier to document the achievements in LF in a country with onchocerciasis in the same way as a country without onchocerciasis. Programmes should try and assess the onchocerciasis situation when TAS are conducted. Can there be joint dossier development for LF and onchocerciasis? If the criteria set out for both validation for LF and verification for onchocerciasis have been achieved, this could be done. Does the WHO have any recommendations and/or guidelines for addressing the potential STH treatment gap created by LF MDA scale-down? Ideally national programmes would have information on prevalence/intensity of STH to help determine frequency of treatment and information on potential platforms for STH-only treatment. In many countries, this may mean a shift to school-based treatment. WHO has published a manual to integrate assessment of STH prevalence and intensity with TAS (http://www.who.int/intestinal_worms/resources/9789241508384/en/ ), so that national programmes will know if STH preventive chemotherapy needs to continue post-LF MDA and the frequency of treatment. In some countries, implementing this methodology has proven difficult, as teams need to visit schools the day before to drop off stool sample collection materials and/or stay longer at each school to collect stool samples. Is FTS appropriate as a pre-TAS tool? FTS is approved as appropriate for use in all surveys within GPELF.